LONDON - Pierre Omidyar, the founder of eBay, is set to launch a new site called Honolulu Civil Beat, which he hopes will persuade people to pay for news. The Hawaii-based billionaire is planning to provide community news for the state on a new model, the Associated Press reported today. Users will be required to pay to discuss issues, ideas and exchange information about matters affecting their communities. 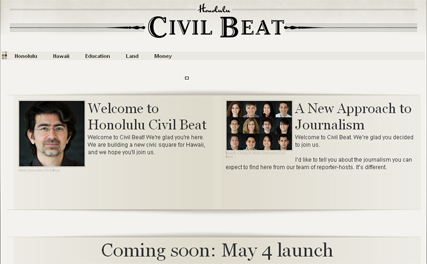 Civilbeat.com goes live in beta form today, with plans to charge US$19.99 for monthly membership. PaidContent's Staci Kramer termed the site an 'online civic square.' Omidyar told her that the site would be a place where Hawiians could "learn about and better understand our home, the challenges we face, and debate and discover ideas and strategies for moving forward". Currently, the two posts on the site state that users can view the rest of the article by becoming a member. The limited introductory offer is $4.99 for the first month, which will last until the launch on 4 May. Non-members will have limited access to content and cannot post any information on the news site. After the launch, full access to the site will cost $19.99 a month. This will include access to content and participation in discussions, and the means of payment is restricted to Paypal. The website will be edited by veteran newspaperman John Temple, the former editor, president and publisher of the Rocky Mountain News, which ceased publication in February 2009. Temple told the StarBulletin that "we believe people will pay for content and experience that they value." Honolulu Civil Beat promises to provide in-depth reporting and analysis, with "reporter-hosts" posting articles, interacting with readers, providing frequent updates and hosting discussions, with an objective to become a civic plaza for Hawaii residents, the AP reported. The website will feature a topic page for each issue, wherein readers can find links to stories, history and background information. The unique feature of this website will be the discussion section, where Civil Beat members will be identified, and hateful, obscene, racist or mindless commentary cannot be posted by anonymous readers. "We'll have a billing relationship with them and so we know who they are," Omidyar told the AP. The online news service will be primarily focused on Hawaii and is not looking to expand to other areas anytime soon. Omidyar told the AP: "It's really critical to help find a new way to do journalism that connects with ordinary citizens in a better way. As a new startup, we have the opportunity to reinvent that, and bring journalism back into the centre of conversation." Omidyar said having paying members provided instant feedback from readers and functions, with no printing presses, trucks, sales staff or other "legacy" obligations, far different to traditional media that are advertising-based.